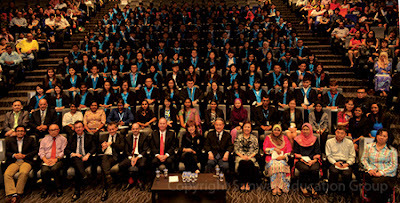 “I think it’s only proper that I thank our wonderful lecturers for always being fun, encouraging and being there,” said Sharifah Aliah Syed Alwi Alhabshi, valedictorian of the Sunway College Foundation in Arts (FIA) at the programme’s15th Graduation Ceremony. “For the last 11 months, my mind hasn’t had a chance to rest. Every subject provided me with new information and perspective, from the “soft skills” of team building and change management to the “number crunching” skills of statistics. FIA is not just about learning facts, it is about socialising, developing opinions, juggling projects and activities with academics – finding laughter in situations that don’t seem funny at the moment,” she said of her time in the FIA programme. Her advice to her fellow graduates, “Follow your passion, stay true to yourself, never follow someone else’s path because FIA taught us to go confidently in the direction of our dreams. It helped recognised the things that we want to do or if you’re still clueless, at least now you know what you DON’T want to do.” Sharifah plans to pursue further studies in International Relations at the University of Nottingham. The graduation ceremony marked the culmination for 208 students in the FIA programme. A total of 15 graduates who displayed consistent academic performance in certain particular subjects received the Vice-Chancellor Subject Award. Top student Ng Ching Wenn was awarded the Tan Sri Dato’ Sri (Dr) Jeffery Cheah Continuing Scholarship. 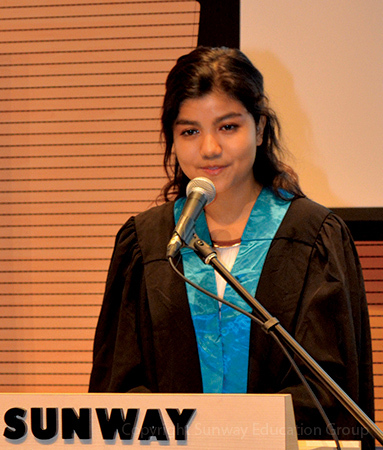 The scholarship will cover full tuition fees for her studies in BSc (Hons) Accounting and Finance at Sunway University. Ng said her time in the FIA programme has helped broaden her perspectives as she gained exposure through different experiences in movie editing, advertisements, even planning a wedding for class assignments. The former student of SMK Tengku Ampuan Rahimah, Klang has built up on her communication and presentation skills, she finds that she is better at approaching people and starting a conversation. Ng who achieved an aggregate of 91.45% received the Vice-Chancellor’s Subject Award for 3 subjects; Mathematics, Introduction to Accounting Techniques and Accounting Processes and Reports. She attributes her achievements to her FIA lecturers and friends. 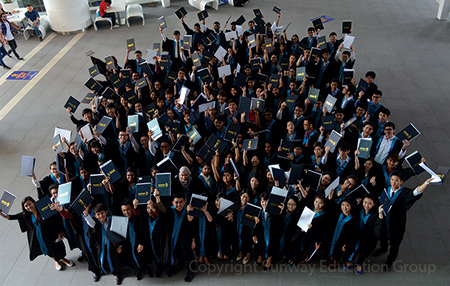 Together with Ng, a total of 114 of students received scholarships for studies in various programmes in psychology, business, computing, communication, hospitality or the Victoria University degree programme under the Tan Sri Dato’ Sri (Dr) Jeffery Cheah Continuing Scholarship. Certificates of Appreciation were also presented to 2 students, Alvin Pung Zheng Xiong and Ragvendrn Rajan for their various contributions. 19 year old, Alvin Pung, FIA Student Committee President said his involvement in various events such as Teachers’ Day and Talent Night helped tremendously in improving his communication skills. He cited that he received plenty of help from his lecturers and friends. Dr Elizabeth Lee, Senior Executive Director of Sunway Education Group and Sunway University to the graduates in her speech reminded the graduates that as they move forward in the pursuit of a great future, they will keep in mind that learning never stops, for it is a never ending journey where they will face challenges and obstacles, all part and parcel of life. “In your pursuit, do not be afraid to try new things and do not be afraid to make mistakes, for make them you will. Bear in mind, those who never make mistakes are those who never try anything new. Mistakes and failures are guideposts in your learning journey, make sure you learn from them, and not carry them forward into the future. It is one thing to make a mistake, it is another to keep making it. Make sure you learn from your past mistakes” she advised the graduates. Bannerizer made it easy for you to promote ClickBank products using banners, simply visit Bannerizer, and grab the banner codes for your chosen ClickBank products or use the Universal ClickBank Banner Rotator to promote all of the available ClickBank products.